Lovely old Hall 6 cup teapot in the Hollywood shape. 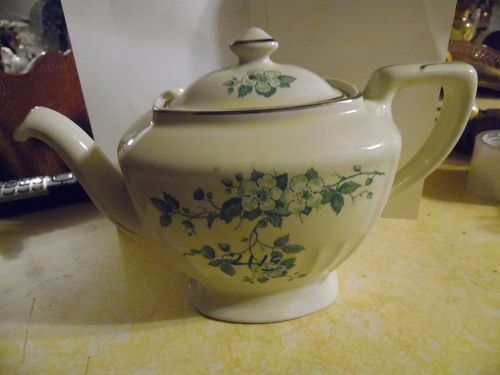 This must be a rare pattern as I could not find it on Replacements or in my Hall China books. Both sides are decorated with green blossoms, branches and leaves, over a white background with platinum accent trim. Some wear on the spout trim, but otherwise perfect condition, and no chips or cracks. Steam vent in the lid. Measures 6 1/2" tall bottom to top of finial, and is 10 1/2" from spout tip to outer handle. Hall Superior 6 cups bottom stamp.